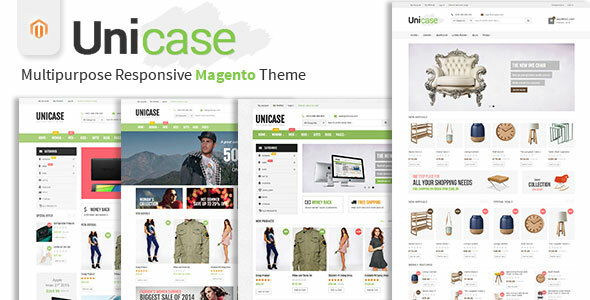 Unicase is a multipurpose Responsive Magento Theme suitable for every kind of online store. 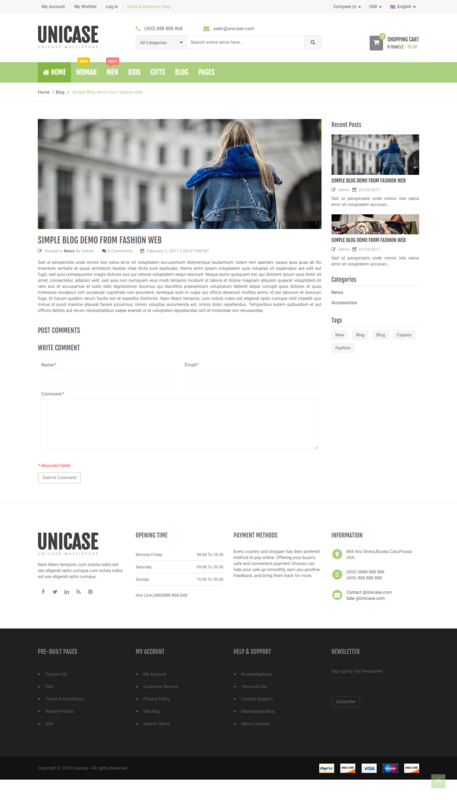 Theme is built using Bootstrap 3 making it fully responsive. 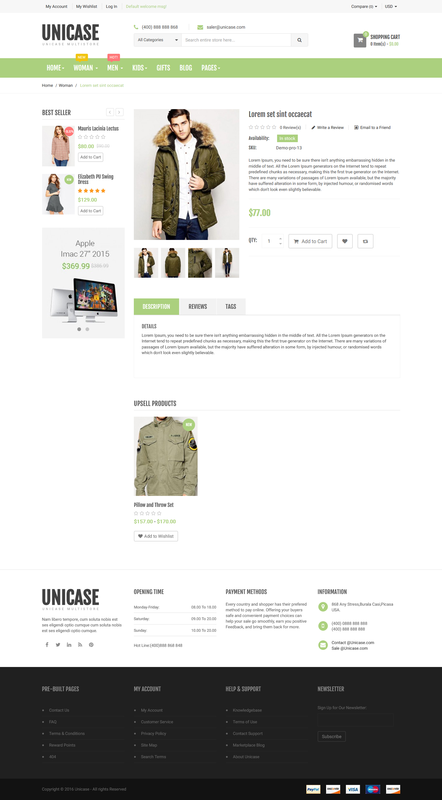 Some features of theme includes Ajax Add to Cart, Product Quickview, Add to Wishlist and Compare. Admin manageable Main slider and product carousels. 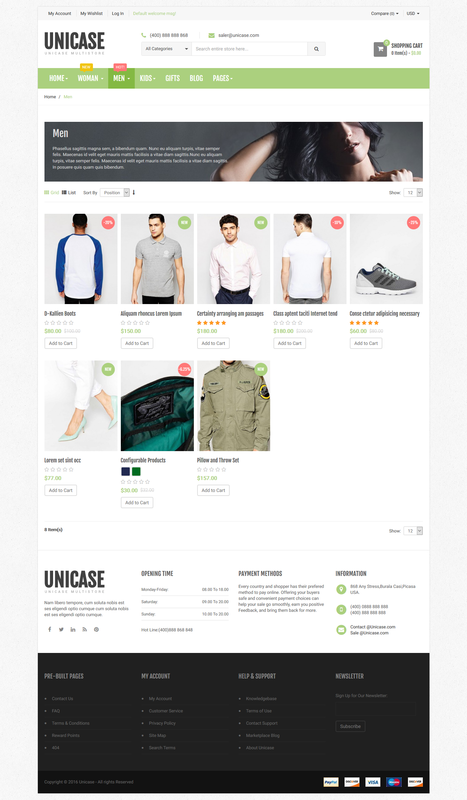 Theme supports Fulll width and Boxed Layout which is easy manageable using dedicated Theme Admin Panel. Custom columns of Homepage, Product Listing and Product detail page. 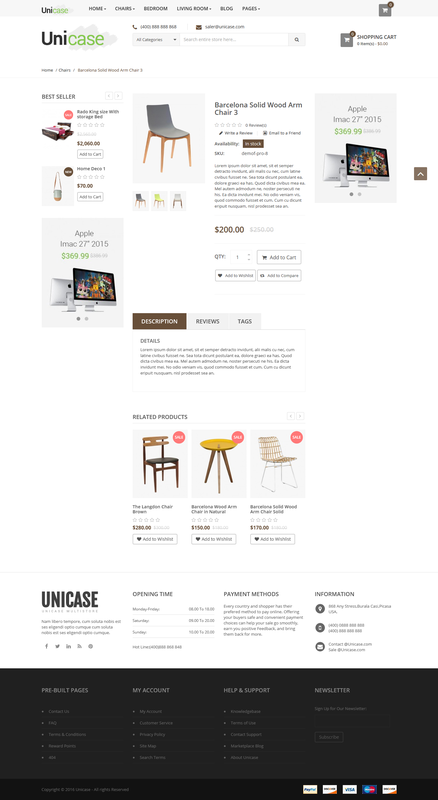 Product detail page Horizontal Tab and Vertical Tab. 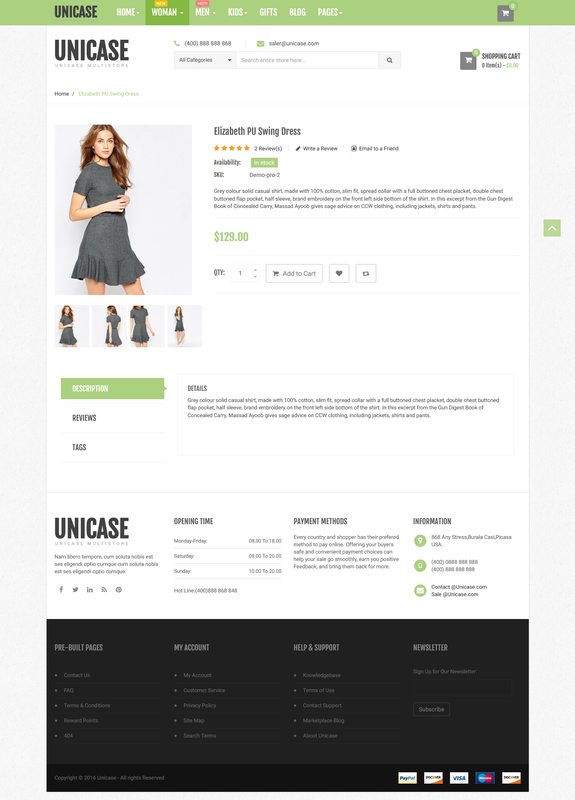 Category Info Display 3 Variation(Default, Boxed Layout and Full Width). Filter Specific Categories Homepage Products List. 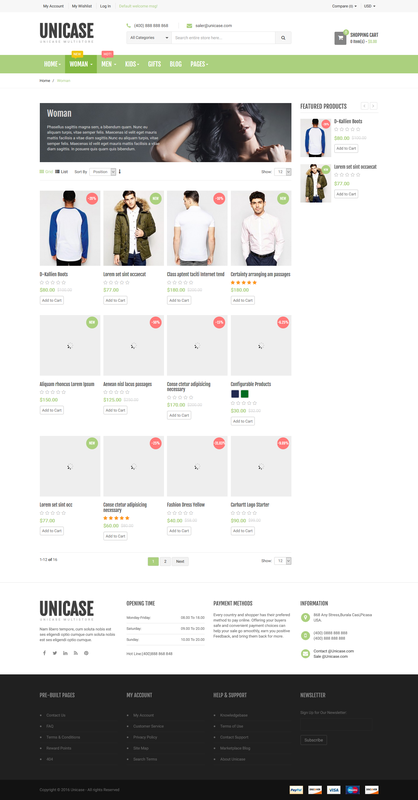 Display Specific Products List in Homepage. Various style of display category info. - Fixed : Generated template error in error log files. - Fixed : Cart page apply coupon code issue. - Fixed : Category description display different layout issue. - Update : Category Page on filter go to top products list. - Fixed : Product Gallery issue. 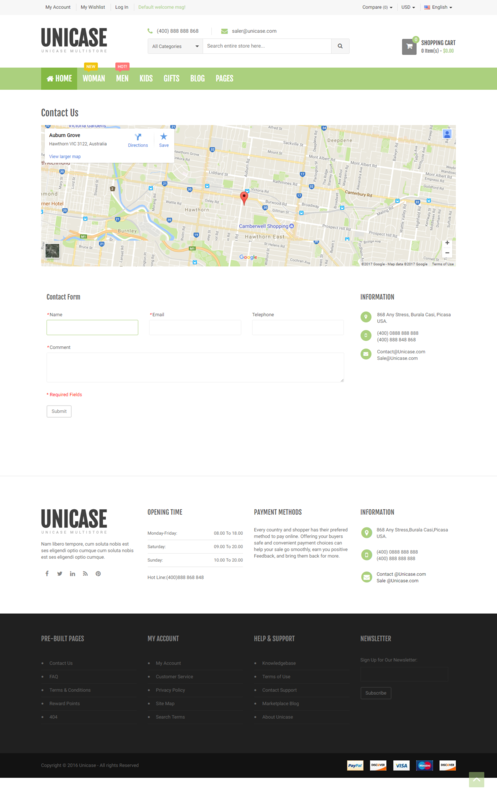 - Fixed : Contact page responsive issue. - Fixed : Apply coupon code issue. - Fixed : Some css issues. - Add : CatalogCategorySearch Module for improve theme speed. - Update : Optimized code for megamenu. - Fixed : Mobile view on mainslider scrolling issue. - Fixed : Some css bugs. - Fixed : Is_secure and isGalleryImageVisible issues. - Fixed : Optimized code. - Fixed : Improve speed.